I’m sure there are some authors who get their books done well ahead of time. Everything goes smoothly, and they can sit back and sigh with satisfaction as they email in a successfully-completed project well ahead of deadline. I finished a book today, and there was a lot of good, bad, and ugly. Yes, that was me running out to the mailbox in my pajamas at noon. No, I had not showered, nor had I brushed my hair. And since I don’t want to post that bad of a selfie, I’ll show you my poor dog. 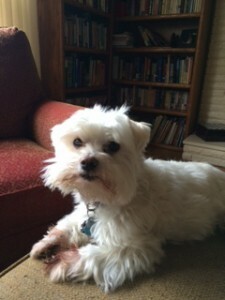 He hasn’t been groomed in weeks and it shows. On the plus side, though, he made it into my novel! When my teenage daughter asked for yet another time-consuming favor, I did not respond in a way that reflects well on me as a mother. Having a book deadline coincide with tax deadlines and boyfriend issues is a bad idea. Please do not alert the health department about the state of my kitchen. I probably revised this particular book more times than any book in recent memory, possibly excepting A BOND FULFILLED, which was also a bear to write. But books like this are sort of like your most troublesome children; the challenges just make you love them more. Since I’d added and subtracted so many scenes, reading the final manuscript one last time was a bit like reading someone else’s book. I surprised myself by being thrilled with how A SOLDIER’S SECOND CHANCE turned out! The book I finished today, #4 in my Rescue River series from Love Inspired, will be out early in2017. That’s a long time! To whet your appetite, I’m giving away a signed set of the first two books in the Rescue River series to a random commenter who answers this question before April 15: What’s the last line of the last romance novel you read, and do you like it? First off, how did you get into my writing room to take that photo, Lee? LOL! My floor looks exactly like that when I’m working on a deadline. 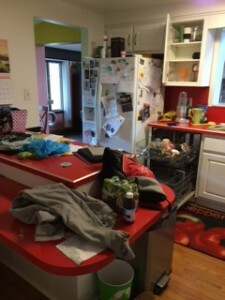 Love the picture of the kitchen, shows you have been working really hard and maybe the teenager could have given it a once over for you. Feel for you but you did it. Well done. Answer to your question, What’s the last line of the last romance novel you read, and do you like it? The last line Is from the bible: “The Grace of the Lord Jesus be with God’s people. Amen.” And yes I like it very much. Jill–please don’t ask about taxes! I’m glad somebody else’s writing room looks that bad. And Margaret: you can’t get much better of a last line than that! PS: My working station looks way worse than yours if I have a deadline. I also spread through the living room sometimes if I need to change scenarios (and take some of the mess with me–like I did yesterday). Congrats on meeting your deadline! Priscila, I LOVE that last line. So sweet and promising. And unfortunately, my office IS my living room, so there’s no way to hide the mess! I wish I could say my house only looked that way around deadlines. But. Um. I have two small boys. I’m going to leave it at that. I try. But it’s like they say, cleaning when you have kids unlike brushing your teeth with a mouth full of Oreo. Small boys! I wish I could say it will get better when they’re older, but…. Love the mouth full of Oreo simile! I’m going to steal that, for sure! I have two deadlines falling around tax time this year (one manuscript turning in and the synopsis/first three chapters due on the next by Monday) so sister, I feel your pain acutely. As do my taxes. BUT the great news is this year we get an extra three days since they aren’t due until the 18th (and boy do I NEED them)! Let’s not talk about my house, okay? I have a three year old, a day job, and writing deadlines. Enough said. Last line of the romance I recently finished reading: “Then I closed the sketchbook and gently slid it off the bed and onto the floor at our feet, suddenly gaining a vast preference for the flesh-and-blood husband in front of me over the timeworn drawing of his likeness.” And yes, I like it very much. It’s a whisper of HEA for a couple who have been through the wringer and can finally be happy together. Ok, so I want to know what the name of that book is so I can read it! Wow, that is an AMAZING last line! I’m so glad I asked this question. It’s going to make me up my game with endings. Our taxes were challenging this year. My poor husband was on the phone with the tax software company and the IRS. IRS said to submit a paper copy, the computer couldn’t figure it out. I liked it, but am always disappointed when the book ends, I always want to know more ☺. So. ….I seem to enjoy series! Ooh, that’s a good one! As someone who writes series books, I’m glad to hear you finish a romance and are eager for more. Interesting, Margaret. Was that a historical or a contemporary novel? The last line of the most recent romance I’ve read was this: Funny how the biggest mistake of her life turned out to be the best thing that ever could have happened to her. Congrats on meeting your deadline! Those are always “fun” whether self- or editor-imposed. And no fair for you to bring up taxes… don’t you Canadians have two extra weeks? Mind if I ask what book that’s from? It sounds really familiar and it’s driving me crazy trying to figure out where it’s from and if I’ve read it. I know the feeling, Merrillee… that’s one of the bad things about deadlines. It’s hard to keep up with personal reading. Hey, that’s a good idea… including the title in the last line. Or maybe the author got the title from the last line. “It didn’t mean anything did it” after catching the bouquet at her sister’s wedding in Kiss Me Forever! “Oh yes. There will be kisses.” She chuckled and pulled his lips to hers. Another one that includes the title in the last line! This is a cute one. 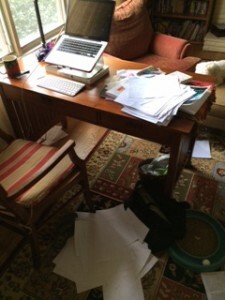 So comforting to see your pics of your house during deadline! Glad I’m not alone. Loved reading your comments and the pictures. I am not a writer, but I can’t anything about your kitchen. Mine get to looking like that because I am reading. “Yes,” Cal said, rubbing Tippy’s head and giving Gina another kiss, “I finally did.” From Sit, Stay, Love by Dana Mentink. I loved the book. Ha, Ann! And that’s great that the dog?/cat? got into the last line of the book. At least, I assume Tippy is a pet! Thank you, Lori–that is such a cute line! Oh, thank you, Lee, for battling deadlines and kitchen nightmares! I love reading the results! Sneaking a look at how you write is fascinating as you were the first author I started to buy on amazon. Ahem! “She sighed happily as the sun warmed her face, the sea air washed over her, and her heart sang.” This is atop a ferris wheel with her hero by her side. So sweet. Sigh. Awww, on a ferris wheel yet–love it! And thank you for being a fan. Lee, I loved the blog post and I love all your books. Thank you, Linda, you are very kind! Your post reminds me of my favorite Western movie…..now I have that theme song running in my head….haha!! I can surely understand those bad & ugly days Lee! We all have them at some point in time. I can just see you running out to your mailbox in your pj’s, wild hair flying in the wind :-D I hope someday you can look back and laugh at yourself, because really that’s the best medicine to cure a not so good day! P.S. By the way, that was from Olivia Newport’s “Hope in the Land”. Fourth book in the Amish Turns of Time series. 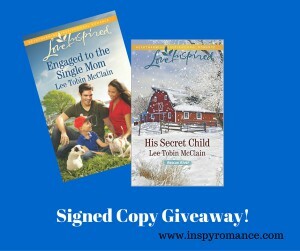 Oh, I’m so sorry….I forgot to add, thank you for the chance to win the first two LI books in the Rescue River series. I don’t have those yet! Yes, I loved A Bleu Streak Christmas by T.I. Lowe! It was so laugh out loud funny that my husband who never reads books read multiple pages until I took it back so I could read more. Good, good story! Thanks for the chance to win your Rescue River books! I love your Sacred Bond series and want to get my hands on some of your other titles. Thank you, Beth and Trixi!